we feel that we can help you with superb detailing products & car valeting products from prestigious companies such as Car-Chem and Angelwax to our carefully chosen products from our own Autocaredirect range with many more to come. With our Autocaredirect Pro-Range we proudly supply many of the countries largest fleets including car rental, chauffeur companies and funeral directors as well as car dealerships for their everyday needs of quality products. Every car detailing & car valeting product in our store has been tested by us. foam has been thoroughly endorsed by us. As you explore our range, which will be growing weekly, we hope it inspires you to purchase something new. 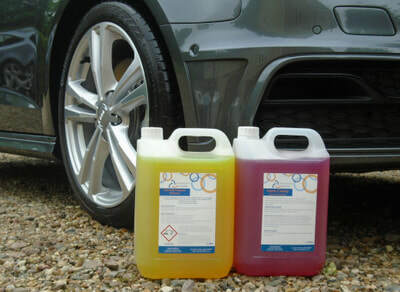 New product coming soon - Autocaredirect Pro-Range. Aqua Rinse *NEW* (Bodywork rinse aid) 5 Ltr A safe and 'non-hazardous' to use polymer wax additive which gives an invisible polymer coating. Providing stunning water beading results, causing water to bead and roll off the vehicle surface to dramatically reduce the drying time. Fantastic for the professional that wants brilliant results and saves a massive time in drying. A go to product for darker vehicles, reduces smearing, does not strip wax and deters the build up of dirt and grime. Our main goal at Autocaredirect is to provide our customer’s with a superb standard of service, selling high quality car valeting products & detailing products at very competitive prices. We have extensive knowledge of the car valeting and the car care industry with a rich history gained after looking after large corporate fleets, therefore we aim to provide as much advice as we possibly can. We are a great believer in supporting British products and we endeavour to keep adding to our excellent range, already including such fantastic British car care manufactures as Angelwax and Car-Chem, and our own Autocaredirect range. Autocaredirect are recognized to be one of the UK's leading online Car Care specialists and one of the most successful companies in providing a one stop shop of car valeting & car detailing products. Copyright ©2018 Autocaredirect.co.uk. All rights reserved: Address: The Studio, Old Stackyard, Earl Stonham, Suffolk IP14 5HU.